When William was born I was as prepared as I thought possible. My freezer was full of healthy meals that I could eat one handed, I’d read books about newborns, I’d been to antenatal classes, and I’d watched more youtube videos on breastfeeding that I care to admit! The nursery was equipped, I had a bouncer chair and a baby carrier- frankly, I felt sorted! I knew that I would be tired (I underestimated how tired though), I knew that I would have less no me-time and I knew that it would be a steep learning curve. There was however, one part of motherhood that I was completely unprepared for – guilt. I say sorry to Will literally hundreds of times a day: sorry I have to change your nappy, sorry but you can’t eat dog biscuits, sorry your milk isn’t ready yet, sorry your upset, sorry I don’t know what the matter is, sorry you have to have vaccinations today, sorry but you can’t play with plug sockets/mobile phone chargers/all wires! Sorry, sorry, sorry! It seems most of my day is spent apologising, and whilst some of these apologies are rather tongue in cheek, far more of them are completely sincere, guilt-ridden sorries. This was particularly true in the first few months after Will was born. Despite attending all the classes, watching all the videos, spending a day back in the maternity unit, and getting help from various midwives, Will refused to latch on and breastfeed. This led to a huge amount of anxiety and guilt on my part. I felt that I was failing my son. It was supposed to be the most natural thing in the world and yet for some reason we couldn’t make it work. In the end I expressed milk for 10 months; it worked well for us and we fell into our own way of doing things, but the guilt remained. The rational side of me knew that I was a.) doing my best and b.) that formula feeding was also a perfectly acceptable way to feed a baby, but the new Mum side of me felt dreadful. Breastfeeding wasn’t the only thing I felt guilty about – I felt guilty about giving Will dummy (I have no idea why I felt this was in some way bad, I just did), I felt guilty when after 9 months of no sleep we tried controlled-crying (controversial but a total life saver for us), I felt guilty when Will caught a cold off me, the list is literally endless, and quite often completely irrational! Recently my Mum-guilt is related to my return to work. Will turns one on Thursday (where has my baby boy gone?) and I start work the following week. I have been determined to spend as much quality time together this week as I can. I have been making the most of every day and doing lots of fun things together like swimming, going to the beach and playing on the swings. All this ‘making the most of my time with Will’ along with moving house in two weeks has left me with very little spare time. So today I made a compromise, and you guessed it, I feel terribly guilty about it. 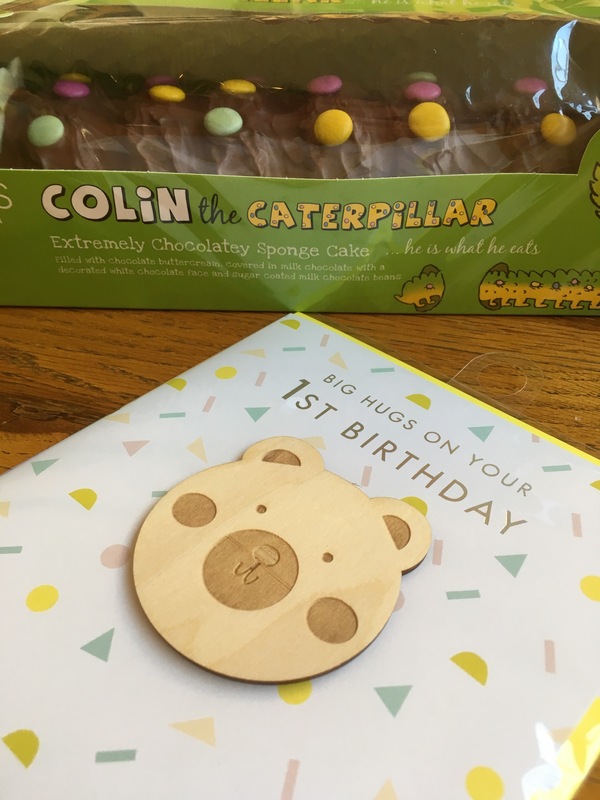 Will’s birthday isn’t going to be the sugar-free paddington bear cake I had planned, its a Marks & Spencer caterpillar cake. Will he get to eat any? No. Will he care? No. He would much rather play for an hour (or six) than sit in his highchair watching me panic over a sponge! I will probably look back at photos of Will’s birthday tea party and cringe that he had a shop bought cake that I wouldn’t let him eat, but I will also remember that by making that decision, I got to spend more time with my precious boy. From what other parents have told me, the guilt never goes. There is something about being a parent that makes you feel like any decision you make is the wrong one. So as Will reaches his first birthday I have set myself a new year’s resolution. I am going to learn to embrace Mum-guilt, remembering that whatever the decision may be, us Mums are all doing what we think is best for our children. It may not always be popular, and it may not always be right, but its always with the best of intentions. I’ve had a few people ask me recently whether I’ve done baby- led weaning or traditional weaning. The answer is that I have done both, and I thought I’d explain why. 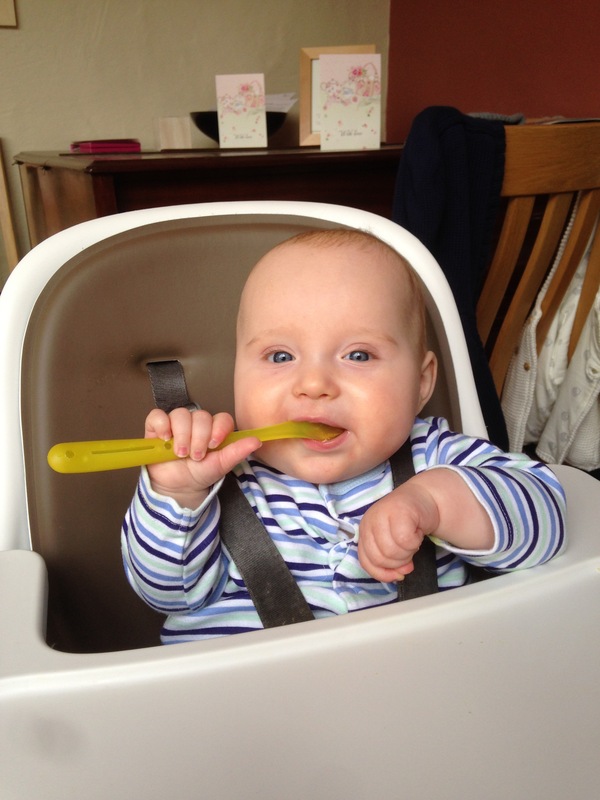 Before having a baby, and if I’m honest, until Will was about 5 months old, weaning hadn’t really crossed my mind. Then out of the blue, my milk-guzzling newborn started staring at us when we ate, really piercing stares! His little mouth would open and close and he would try to grab food off our plates or out of our mouths! As a clueless new Mum, I did what I always do when I want to learn about something new; I bought a couple of books! I read about traditional weaning and baby-led weaning. In brief, baby-led weaning involves providing your baby with foods they can eat themselves. The benefits of this include improving your baby’s dexterity and coordination as well as ensuring they aren’t over fed, leading to healthier eating habits as an adult. It also introduces babies to a variety of food textures and teaches them to chew. Traditional weaning on the other hand involves introducing babies to puréed foods which are spoon fed, and slowly introducing texture to these. As a self-confessed greedy person who has always loved variety, baby led weaning really struck a chord with me. I love my food to be interesting and thought that giving Will finger foods would be a fun and exciting way to introduce him to solids. The pharmacist in me however, wanted to ensure that Will was getting to vitamins and minerals that he needed, most importantly iron. Because for me, this is where baby led weaning could fall down. I have, on many occasions put a healthy, balanced tray of food in front of Will, and he’s rejected all but one food. You can’t force a baby to eat beef or egg if they don’t want to, and in the early days of weaning when babies are being slowly introduced to foods, it can be hard to disguise foods that they don’t like. A purée however can ensure your baby has the nutrients they require. Baby- led weaning can also be incredibly wasteful, especially when eating out. If Will drops food at home, he has a mat under his highchair so I pick it up and hand it back to him – in a restaurant, once it’s been dropped, that’s it. It can be so disheartening to see the food you’ve made thrown away within a couple of seconds of starting a meal! 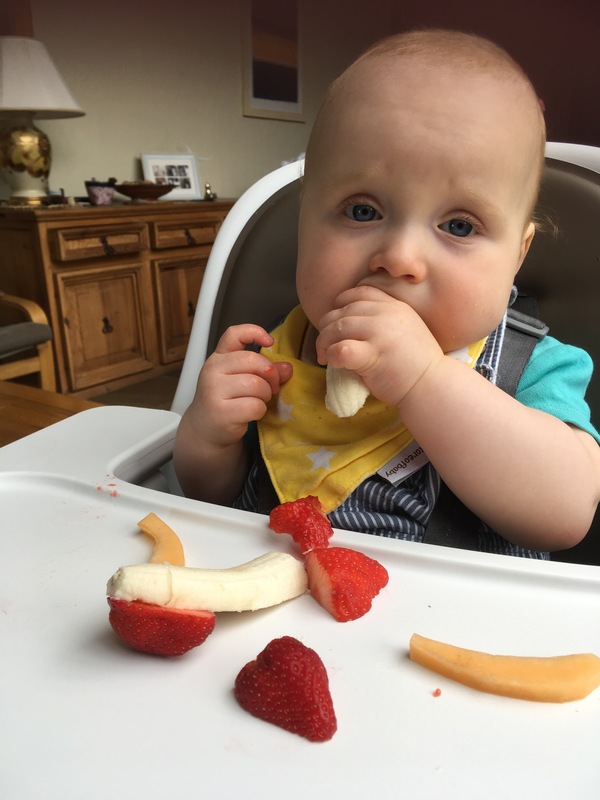 I started weaning Will with a mixture of purées and finger foods, he enjoyed both and it became apparent that the most important thing to me wasn’t whether he was fed from a spoon or not, it was whether we were sitting at the table, enjoying family meals together. I wanted to cook one meal and us all enjoy it. So sometimes Will has our food blended, and other times he has our food as finger foods. It completely depends on the meal. Essentially; food we eat with a spoon, he eats with a spoon! 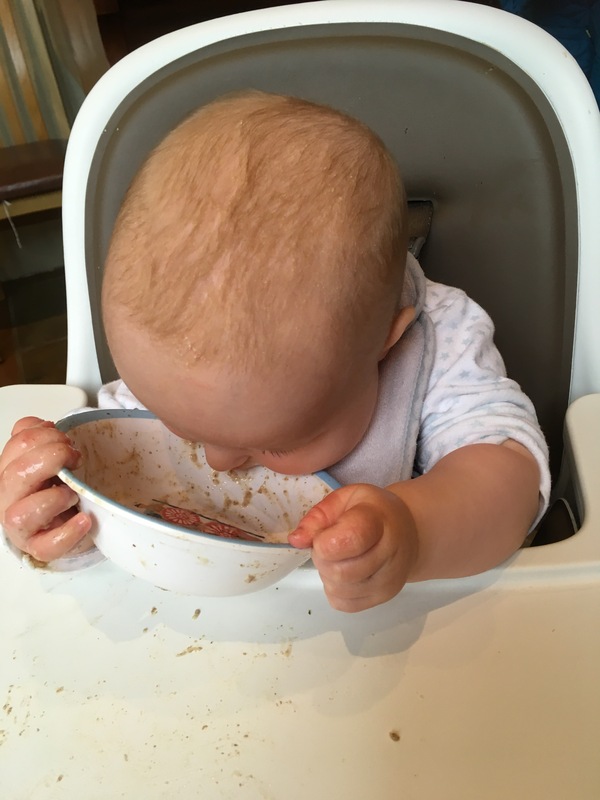 There seems to be a lot of judgement surrounding weaning these days, and people seem to follow either baby-led or traditional weaning, but I can’t help thinking that a mixture of the two can be a great option too! This has worked really well for our family but I would never judge what another family choose to do. Becoming a parent makes you realise that all Mums and Dads are constantly trying to do the best for their children! How did you wean your children? What were your reasons for doing so? I’d love to hear about your weaning journey!